I'm currently a PhD student at Montana State University, in beautiful snowy Bozeman, Montana. I completed my undergraduate degree at New Mexico Tech, which is where I got my start in the realm of infectious disease research. I worked as a technical research intern at Sandia National Laboratories studying viral-host interactions in the context of commercial scale algal biofuel production. Most of my work involved intense hours behind a microscope, and I was itching to get more involved in the applied side of disease research. I went on to earn an MS in Molecular Microbiology and Immunology from the the Johns Hopkins Bloomberg School of Public Health, where I worked on the ecology of a tick-borne pathogen in Virginia and malaria in sub-Saharan Africa. While working on those projects, I found myself frustrated with how indirectly ecology was addressed, despite being intrinsic to the transmission of both vector-borne diseases I studied. My work at Johns Hopkins left me interested in zoonotic pathogens, and how ecological processes affect disease spillover into human populations. 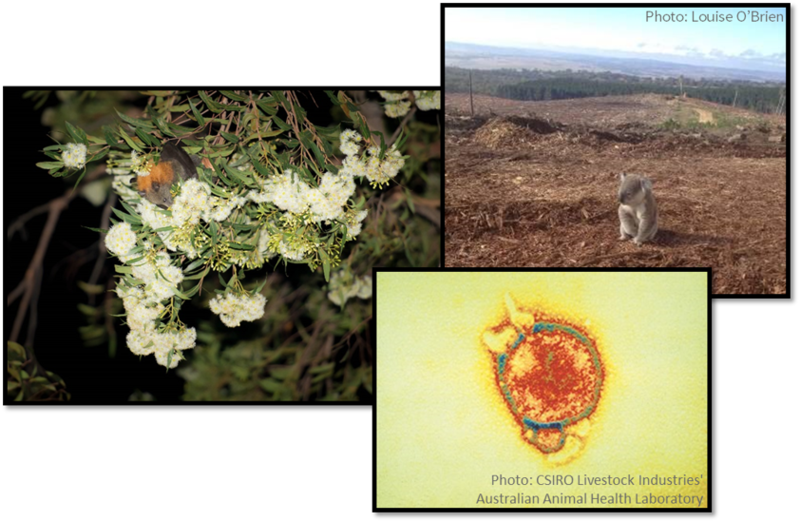 At Montana State University, am exploring these issues by investigating the ecological conditions that drive Hendra virus dynamics in Australian flying foxes. More recently, I received a Fulbright Postgraduate Fellowship to work in Australia for ten months on my dissertation, which is what brings me to the Lab of Animal Ecology! I've been working hard since February 2018, and will hopefully have exciting news to share over the coming months. In Australia, both habitat loss and planting of fruit and floral resources in towns and cities (i.e., resource provisioning) have shifted the availability of flying fox foods. Part of my dissertation, and much of what I'm working on while at Western Sydney, focuses on the complex ways that changes in food resources may alter flying fox foraging behavior, including an increased tendency to utilize urban and agricultural landscapes and subsequent increases in risk of Hendra virus spillover. My research combines under-roost sampling and capture of flying foxes to evaluate their individual health, disease status, diet, and foraging behaviours.